The Interpol police organisation may not use its international arrest warrants for political persecution. Article 3 of the Statutes therefore prohibits „any intervention or activities of a political, military, religious or racial character“. Nevertheless, the Interpol channel is used by the 194 member states for politically motivated searches. For this reason, the German Federal Ministry of Justice and Consumer Protection (BMJV), which is responsible for arrest warrants, examines the deployment of „suitable personnel“ in order to check all existing arrest warrants at Interpol for a possible violation of the Interpol statutes. The employees are to be recruited from the state justice administrations. The Federal Criminal Police Office (BKA) has already been sending a fully qualified lawyer to a corresponding control commission at Interpol since 1 January. Interpol is also referred to as the „International Criminal Police Organization“ (ICPO). It administers the so-called „Red Notices“, in which persons are listed for police search and arrest. 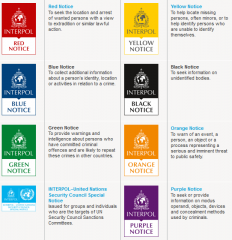 In addition to the „Red Notices“, there are further „Notices“ in the colours yellow (missing persons), black (dead persons), green (warnings) and blue (request for the whereabouts of the persons advertised). Interpol stores information on persons, objects or identity documents in so-called ASF databases („Automated Search Facility“). The ASF file for the personal search is called „Nominals“ and, according to the German Ministry of the Interior, contains more than 200,000 warrants, an increase of 30.6 percent compared to 2014.
International search requests are distributed via the Schengen Information System or Interpol’s national central bureaus. In Germany, the central office in both cases is the BKA. However, not all Interpol arrest warrants are also transmitted to all national bureaus. Thus the BKA only learns of a warrant if it itself belongs to the group of recipients. Every „Red Notice“ received in Germany is checked by the BKA. In the case of „special significance in political, factual or legal relations“, the request is submitted to the Federal Office of Justice for approval. The Office shall decide on the national implementation of the search „in agreement with the Foreign Office“. Following a procedural change three years ago, the Federal Office of Justice must report to the Ministry of Justice any possible infringement of Article 3 each time it receives an Interpol communication. There the existence of the legal prerequisites is then checked again. If a violation of Article 3 is found, the BKA must inform the Interpol General Secretariat. According to the Federal Ministry of the Interior, such notifications by the Federal Criminal Police Office have „been made on various occasions in the past“. The result of the review is then noted in the BKA’s internal transaction processing system. The authority in Wiesbaden does not keep statistics on the number of unapproved search requests. Allegedly for this reason, the BKA cannot list the states in which it found an Article 3 violation. In the past, several Interpol warrants had turned out to be abuses for political persecution; the more well-known cases in Germany included the German writer Doğan Akhanlı and the Egyptian-British journalist Ahmed Mansour, who was arrested by the Federal Police in Berlin-Tegel. In August 2018 Interpol set up a Notices and Diffusion Task Force (NDTF) to examine all existing warrants. A total of five members of staff are to belong to the working group; their start of work had been announced for 1 January. The German Government explains the high number of German staff (staff from the state justice administrations and the BKA) by the fact that Germany is the third largest contributor to the Interpol budget and one of the Member States which „send personnel on a large scale free of charge“. The retrospective review affects around 80,000 searches initiated before 2016. Not all „Notices“ are checked, but only the „Red Notices“ for arrest and extradition. This decision is not comprehensible; it is conceivable that „Blue Notices“ to determine the whereabouts of people could also be instrumentalised for political persecution. Until the establishment of the Task Force, Interpol had only sporadically checked the old warrants regarding their abuse for political persecution. The General Secretariat found 130 arrest warrants to be in breach of Article 3 and informed the central offices. The German Government wants to keep secret which states they came from. The reason given is that the persons persecuted there could subsequently regard countries such as Germany, in which the searches would then be cancelled, as a „safe haven“. However, it is not only Interpol that is responsible for any misuse of its instruments. Despite Interpol’s announcement that 130 requests would be segregated, the German Federal Office of Justice and the Federal Foreign Office have decided to keep five of these cancelled requests and convert them into national arrest warrants. The Government does not specify the countries from which these warrants originate. This is made possible by a provision in the Interpol Statutes. The ban on the use of Notices for political persecution applies to the police issuing the alert, but not to the authority receiving it. Formally, the German authorities are therefore not bound by an Article 3 decision of the General Secretariat in Lyon. According to the Government, a corresponding statement by Interpol on a politically motivated search request only has an „indicative effect“ for the German decision on its legality. The European Union has no competence to improve Interpol arrest warrants. Nevertheless, following the arrest of Doğan Akhanlı, the EU Commission held a meeting with authorities from Germany, Belgium and Spain. The Commission then announced that it would hold a workshop to develop a common approach among the Member States. However, the event seems to have not taken place. Efforts at Interpol to improve the quality of warrants have a better chance of success. In future, the national central offices are to inform the Secretariat in Lyon of any „doubts“ about compliance with the Interpol statutes. The department responsible for this, which processes all search requests received by Interpol, will presumably be better staffed and financially equipped. In addition, the issuing authorities will be required to indicate whether the person concerned has been granted asylum in another country when applying for an international arrest warrant. 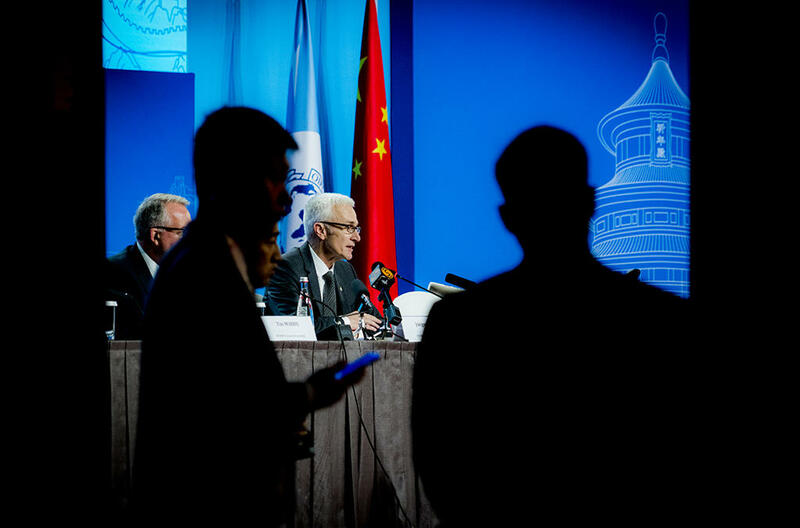 Image: Secretary General Jürgen Stock (Interpol).